Stabilize your bag packaging on pallets, Secure your transports, Optimize your costs. The large and medium-capacity paper bags, plastic bags or complex-type barrier bags are efficient packaging for powdery or small-grained products. It is an economical solution to transport intermediate products or large quantities of products. All of this industrial packaging intended for the final customer have a weak point, they slide. CGP COATING INNOVATION, specialist in anti-slip coatings, proposes innovative packaging solutions that address the instability of all types of packaging in BAGS. Find a solution to all your BAG packaging types. 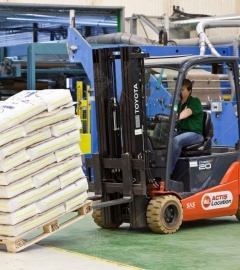 Ensure that bags are properly secured on the pallet until product consumption. Stabilize your products on the pallet and your pallets in trucks or containers, use our LOGISTIC range anti-slip slip sheets. Our STABULON® anti-slip tie-sheet is inserted between the rows of bags on the pallet. It's exceptional flexibility allows it to optimize the contact surface with the palletized bag. 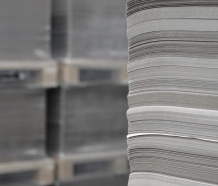 The STABULON® tie-sheet's very high coefficient of friction prevent products from sliding and ensure greater cohesion of all the products on the pallet. Our STABULON® anti-slip tie-sheet is inserted at the bottom of the ballet to prevent the load from moving during logistics and transport operations. Save place in your containers, use our ECOLOGISTIK® Non-slip Slipsheet. Our range of STABULON® anti-slip tie-sheets Paper weights from 70 to 300 g/m². Stabilize your column stacking pallet patterns. Preserve the integrity of your bag, a communication medium. Guarantee perfect palletizing when the pallet is opened. Secure your pallets after they've been opened. No risk of bag rupture. Standard coating is easily removed from all materials, unlike glue.